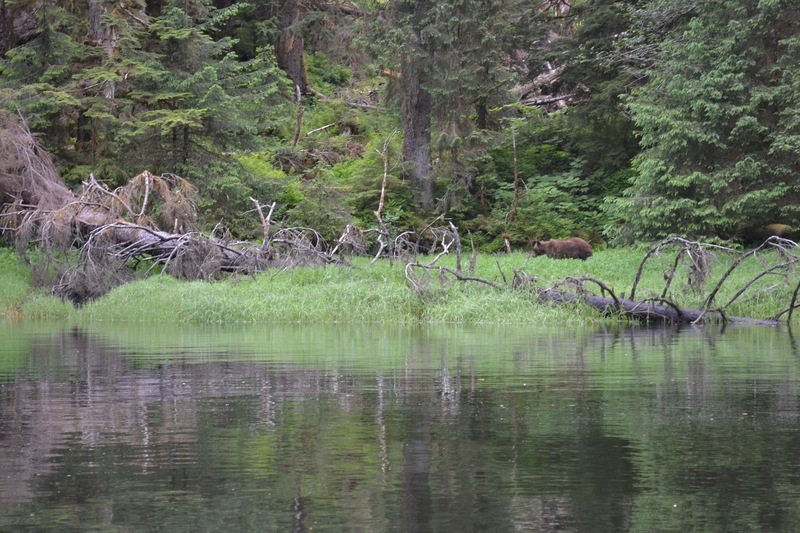 Misty Fiords* National Monument: The most beautiful cruising I have ever done by a long shot. Rudyerd Bay branches off East from the Behm Canal which is not a canal at all but a humongous fjord. Rudyerd Bay is also a true fjord, (not a Bay) although narrower than Behm and with deep cliffs, lots of snow and a giant waterfall every 500 ft. The waters are lightly coloured from all the brackish waters from the mountains. 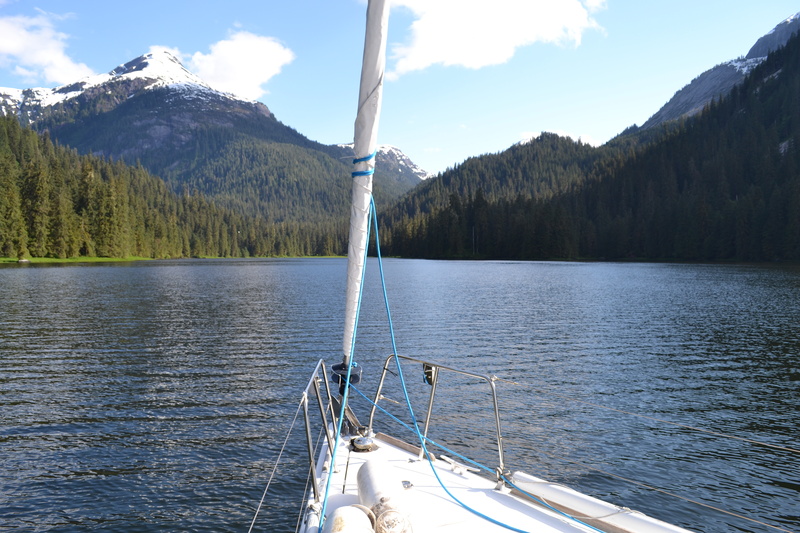 We sailed the entire fjord with the flood under jib alone in winds 8 to 20 knots, the ultimate cruising experience! We are anchored in 32 meters of very cold water at high tide with all our chain out, 160 feet and another 8 ft rope. Many floatplanes are doing daring acrobatics along the cliffs for our enjoyment and to earn higher tips from their fares. They also land in different arms of the fjord to add a landing and take-off to the excitement. This afternoon the mist is all gone and there are only a few pretty clouds high above to adorn the scenery. 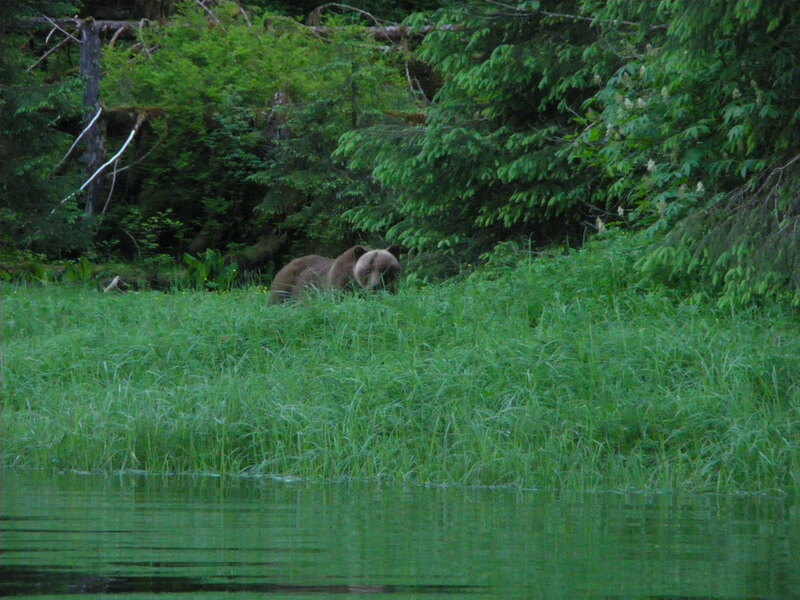 The brown bears are frolicking in the grass on the beach completely ignoring human presence. getting close… with the zoom! We also went past the New EddyStone Rock, so named because Vancouver thought that it looked like the Plymouth light-house. 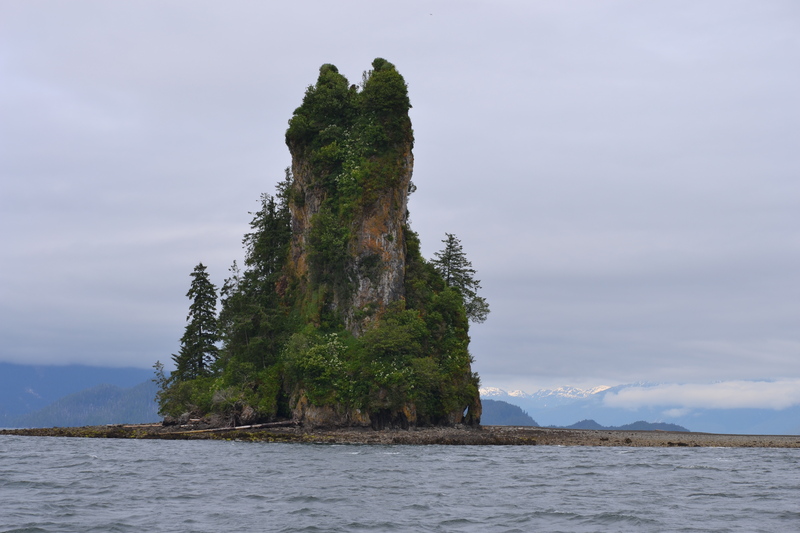 Rising 230 ft from a sand shoal, it is actually a genuine basalt spire remnant of a volcanic plug. Its outer layer has been eroded away by wave action, leaving this dramatic feature. *Fiord, that is how they spell fjord in Alaska! 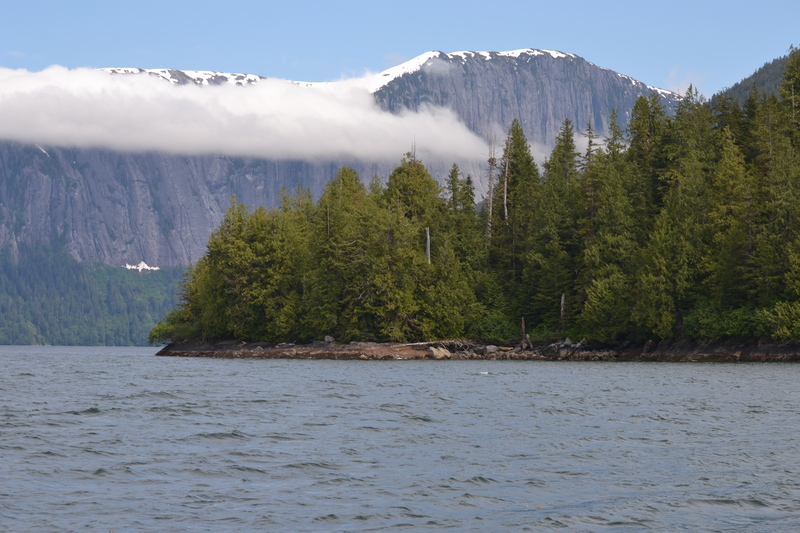 This entry was posted in The Log and tagged fiord, fjord, Inside passage, Misty Fiord, Rudyerd Bay, sailing. Bookmark the permalink. Your Canadian English has really improved! Humongous fjords! It really must be spectacular to give the area such high praise, given all the amazing places you have sailed over the years. Hi there, glad you are having some nice weather. 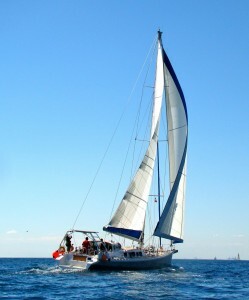 The pictures are beautiful and you are doing a great job describing the scenery and the cruising,sounds very peaceful. It is nearly a month you are away already! We have had a few nice days here, sunny but not too hot but it is raining today. With all the rain we have had the trees and flowers look amazing and the grass very lush. Really enjoying your blogs. 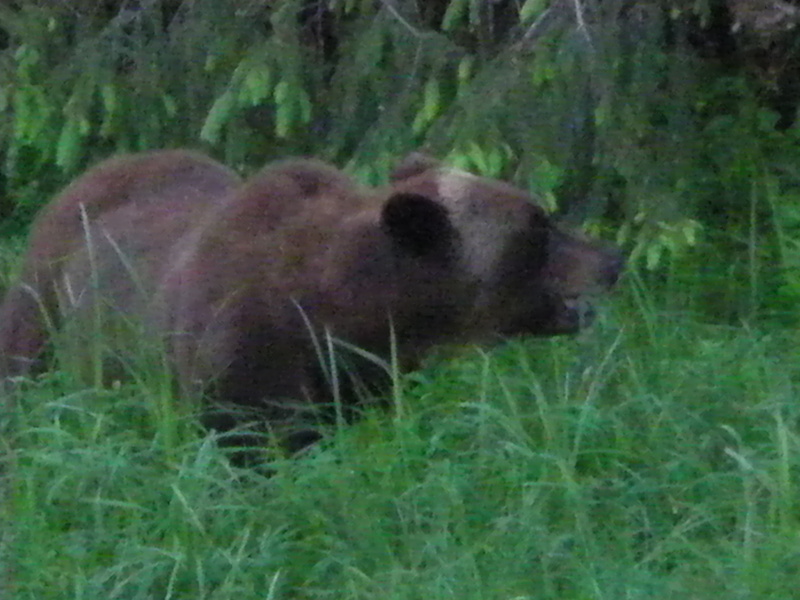 Ben thinks this is a Kodiak bear, it is so big!